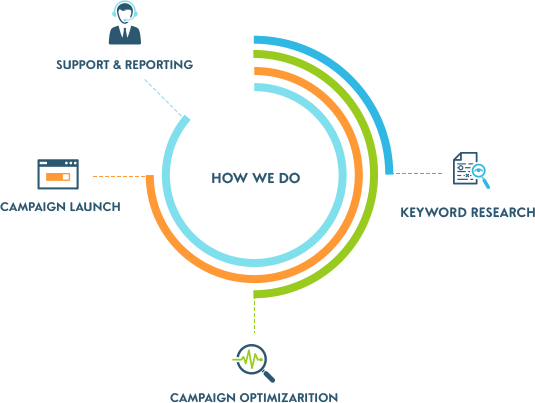 We spend time learning about your company, your industry, and your competitors so we can optimize your campaign around the metrics that will have the biggest impact on your bottom line. National market keyword research to analyze current keywords that are being targeted while suggesting new and improved keywords to go after. PPC team will manage and create display ads, text ads, and remarketing campaigns that are highly relevant and direct towards a compelling landing page. Design team will work with PPC team to create a stunning landing page that converts. Continuous testing/optimization to drive down CPA, drive up conversions, and increase ROI. Dedicated team of account managers and analysts. Multi- faceted and analytical reporting. Paid search advertising is essential to the increased profitability of an ecommerce business. Act Bold prides itself on offering top of the line paid search management and consulting services. Our background in owning and operating ecommerce stores has given our team a competitive edge over our competitors. With that in mind, we understand how much every dollar is worth to your business. Your bottom line is ALWAYS our top priority. The thought of creating and managing a PPC marketing strategy can drive companies crazy. The meticulous research, proper management and cost controls, bid optimization, and landing page optimization can be quite overwhelming for companies looking to achieve a successful PPC campaign. Act Bold is here to help your company grow online and manage profitable advertising campaigns. We spend time learning about your business, your industry, and your competitors so we can optimize your campaign around the metrics that have the biggest impact on positive ROI. Our PPC management services include Google AdWords, Google Shopping, Bing Ads, and Yahoo Gemini. We find that having two eyes on your account will drive more creative ways to boost ROI.